BANANA! So come inside and let me make something delectable out of you. Ray and I were supposed to have a banana baked good throw down, but Ray decided to be lazy bones. Yes, I am calling you out Ray. I’m not a huge fan of eating bananas. I’m pretty sure I’m mildly allergic to them — lips get numb when I eat them straight from the peel. However, covering them in lipids, sugar, and flour seems to solve that problem. 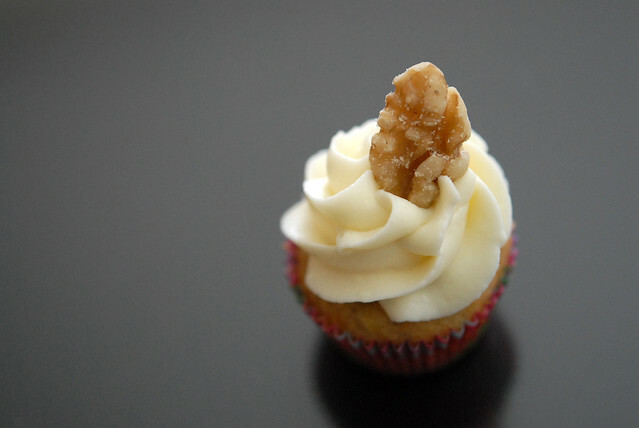 I had cupcakes on the brain, so I figured why not fall back on a classic banana nut cupcake (e.g. a frosted muffin). Say hello to your new friends the apple and the brown paper bag! The magical apple and the brown paper bag are legit going to be your best friends if you’re like me and have no patience. 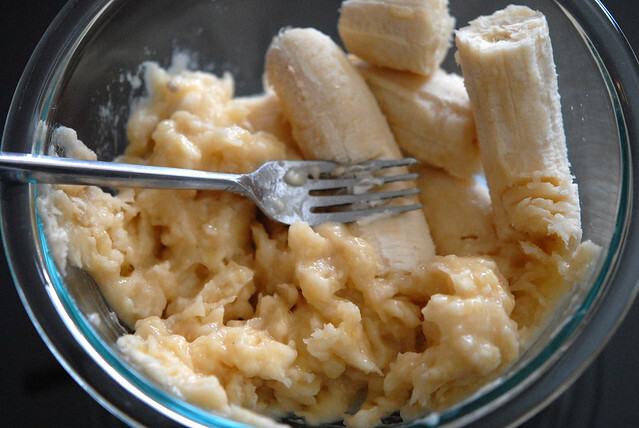 I don’t like waiting for my bananas to get mushy mushy ripe. And that’s where these guys come to play. 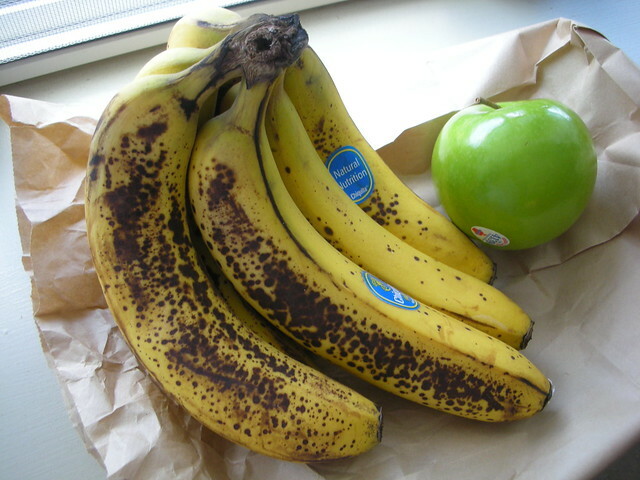 Just throw your bunch of bananas (it would be wise to buy yellow ones vs. green ones to begin with, don’t be dumb) and just wait 24-48 hours vs. an entire week! Voila!!!! Preheat oven to 350 F. Combine the dry ingredients together in a large bowl. 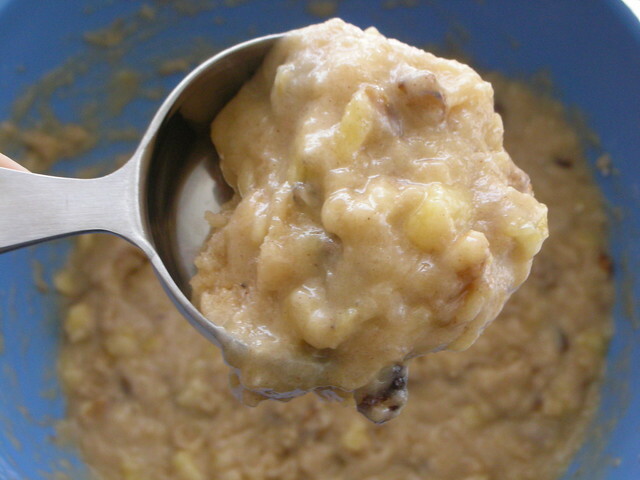 Mash the living daylights out of your bananas (see the visual above). I let them just settle for a minute so they have time to get nice and juicy. You want juicy because the amount of dry ingredients seem pretty overwhelming compared to the wet. In the mean time, combine the 3 beaten eggs, the vanilla extract, and the 23957892345324 lbs of vegetable oil. Ok ok, so this is something I feel like you can get around. For instance, you can pull the healthy brownie approach and substitute half of this oil for some apple sauce. I don’t believe in being particularly healthy when it comes to desserts. I went for the oil 100% without even flinching. Plus, I didn’t want my cupcakes tasting anything close to apples. Stir in the oil, egg, vanilla mixture just enough to get all of your dry ingredients wet. At this point, you’ll want to pour your bananas and any extras you may want like chocolate chips or nuts (walnuts, pecans, almonds, etc.). I used walnuts. Paula called for pecans, but it’s up to you and your taste buds. Pour your batter into muffin cups, filling them about 3/4. I opted for mini cupcakes and got a full 75 mini cupcakes out of this recipe. Bake cupcakes for 15-20 minutes, or until a toothpick comes out clean. Frost with a standard cream cheese frosting [2 8 oz. package of cream cheese creamed together with 2 stick of butter; add 1 lb. confectioners sugar (or less depending on how sweet you like your frosting), 1 tsp. vanilla extract]. In the past, I’ve added 1 tsp of cinnamon so that it would taste more like the cupcake. You could probably add some banana extract to the frosting as well, but I’m not a huge fan of extracts aside from the standard vanilla. these look soo goood! but i guess – if you actually care about too much calories, it is better too leave out the frosting. wait…. no. not an option. I LOVE banana cake!! And the fat in it 🙂 I haven’t tried Paula Deen’s recipe, so it looks like I must!